The main difference between present communist theory and its previous expressions is that it has now become impossible to conceive of communism as a society of associated producers. This book is about a revolution (i.e. a historical break, not gradual peaceful evolution) that creates communism – not its preconditions. Wage-labour, work-time as cut off from the rest of our life, money, private property, State agencies as mediators of social life and conflicts, all of these must go, and not just be run by collectives. Social change will take time but will start from Day One: in the very early days, the way the insurgents will treat workplaces, organize street-fighting and feed themselves will determine the future unfolding of events. This is no easy task in practice, nor in theory: questioning some of the basics of communism runs into supposed common sense as well as against long-held revolutionary principles. First, what could a communist insurrection be? 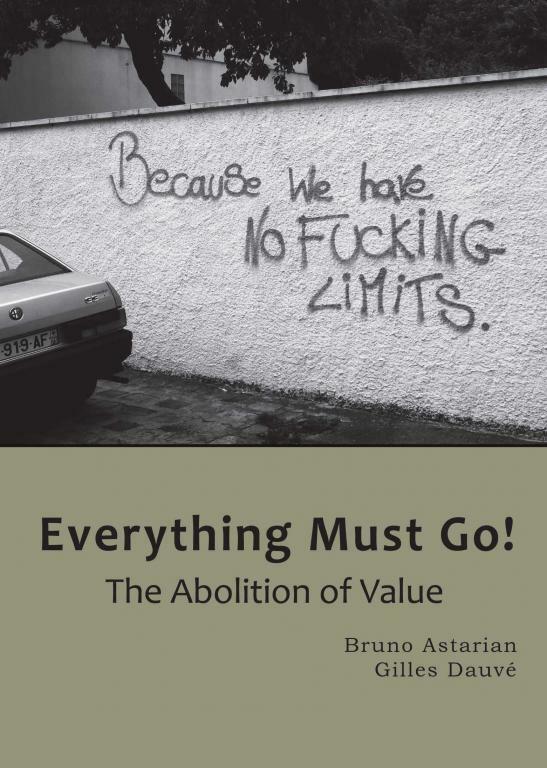 Secondly, we cannot dispense with revisiting the Marxian theory of value. We can no longer regard the first chapter of Capital as the foundation of a theory of value adequate to our time. Lastly, this is the real world we are talking about. From bicycles to child-rearing, everything relates to ways of life now determined by capital/wage labour relations. This is why the last part of the book broadens the field to a number of vital and daily issues, so-called small ones as well as big ones. jura mentioned the ICT's response to this on https://libcom.org/blog/dauve-versus-marx-31072018 (which doesn't cover this book at all). Under the labour certificate distribution system, outlined by Marx, the exchange of labour and means of consumption is based on the actual labour time. What the ICT doesn't do sufficiently for me is explain how measuring the total time taken to produce an item can be done without human labour in the abstract. Let's say I'm making a chair. The wood comes from a forestry, with some transport and machining further up the production process requiring all the tools that go into those processes. Putting the chair together means some cutting, drilling (with a drill and all that creating a drill entails), screws, happens in a building, requires electric. Now clearly if it takes me 6 hours to saw some wood, do some drilling etc., then regardless of how how many chairs I make, you could give me a voucher for 6 hours. But, what the ICT does not answer, is how you could measure the time that went into the production of the chair - because the chair is social labour including raw materials, tools, fuel, electricity etc. all of which taking place at different times (in some cases decades ago - constructing a road or building for example). If goods are distributed in return for labour vouchers, then it follows that those goods must be quantified by a certain quantity of labour, but this bit is unexplained. At a very small scale - say a self-sufficient commune of a few hundred people, then you might more or less be able to measure how much time particular tasks take (total time x people doing them) and work things out from that, so there's probably a way it could theoretically be done, but this doesn't mean it could be applied to a total society. What the ICT also don't get into is whether a system of labour vouchers is desirable. If there are shortages, then rationing is a much better way to deal with them (and rationing looks different for consumable vs. non-consumable goods, on top of that they don't always mean a reduction in consumption - calorific intake in the UK went up on average during rationing). Labour vouchers don't help with distribution to non-workers - children, the elderly, people who've just had children etc. This doesn't mean that Dauve's understanding of value is right, but the labour vouchers stuff in Marx has always seemed like it wasn't very serious or well thought through. My take on this is closer to Dauve and Internationalist Perspective than the ICT. Worth cross referencing this with the longer discussion following David Adam's critique of socialist labor-money schemes (but I can't make a link for this work). Not that I think such a system would be desirable, but I guess it could possible to "pay" with labour vouchers, but rather than price goods accordingly (which as you say be impossible to calculate), you could receive an amount of the total product proportionate to your amount of labour vouchers (e.g. someone who did twice as much labour would receive twice as much of the social product). Are you taking this as given!?! Even post rev? Parents looking after children can't be measured in hours, the idea of parents filling in timesheets to account for getting woken up at 3am so they log that hour of labour time for the voucher is dystopian. So a system based on measuring labour time is either going to continue to ignore reproductive labour, or it'd have to special case it in some way - for example just putting 80 hours/week of labour time on the books for parents for the first three years or something. But then what happens if you have a close friend who looks after your kids sometimes? - you can't transfer 4 hours of your labour time to them, because labour vouchers aren't transferable, would they have to register as a childminder so that you could use four hours of your time to get four hours babysitting and so that they could log the hours? Or does babysitting end up 'unpaid reproductive labour'? Or would you end up spending 4 hours of labour vouchers on something and giving that as a gift (a black market)? There are various other things that stop people from working such as personal ill health, or friends/family being unwell etc. - again if a labour vouchers system is not going to discriminate against those people, it'd need some equivalent of sick notes/sickness benefit and way of administering that. You might be asking whether reproductive labour would still be gendered after the revolution, I can't speak for Steven. but for me the big thing would be to break down the difference between reproductive and productive labour, and to socialise reproductive labour as much as possible (an example that happens now is when nursing homes and nurseries collaborate to have the kids visit the nursing home regularly - entertaining both the kids and the elderly in one go). I do think that labour vouchers or parecon would be a barrier to this rather than 'from each according to ability, to each according to need' + various forms of rationing where that's not possible. The argument here is not that all this labour should be quantified (from above that feels very difficult to me), but that the very quantification of labour and regulating consumption based on it just seems horrible and that'd it'd reproduce dynamics we see now. It requires a whole mechanism of accounting and surveillance that is unnecessary. That's what I'm taking issue with. Some "normal" couples are already quite close today and the reproductive labour gap seems to be narrowing down. My parents were already close and things have improved since then. Jobwise however only 2 out of 10 staff at my kids nursery are men. These issues vary geographically of course and Sweden is probably better than some places. I agree with the criticism of labour vouchers. Just for discussion however I think the search for perfect measurement of work is overstated IF we manage to reduce the sector where labour vouchers are required. Ideally this would shrink down to near nothing right? Reducing unpaid work ie voluntary work is not really of intererest is it? Already wages are set without regard for individual productivity in most cases. I can't see that the need for precision would increase.